The day has finally come. 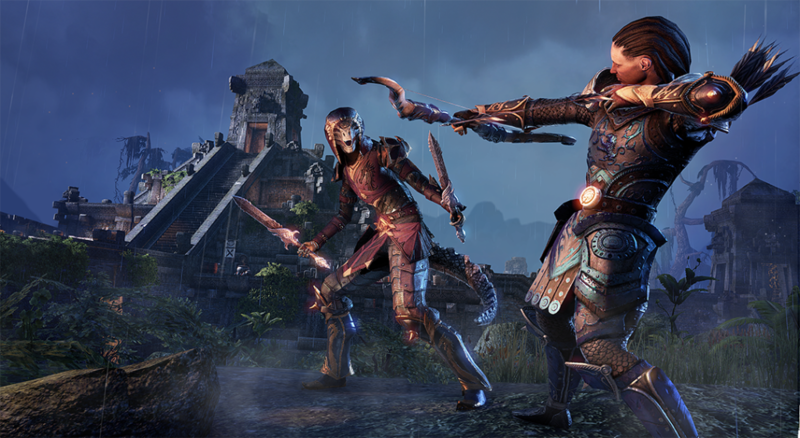 The portal is now open for Xbox One and PlayStation 4 gamers to enter the vast world of The Elder Scrolls Online: Tamriel Unlimited. All you need to do is step through. Now, it’s understandable if the prospect seems a bit daunting. After all, there aren’t a whole lot of massively multiplayer RPGs available for consoles. And there are places where ESOTU diverges from its console predecessors. But there’s plenty that’s familiar, too. This is an Elder Scrolls game, after all, which means that if you’ve played Morrowind, Oblivion or Skyrim, you’ll find lots of things to make you feel right at home. The world itself has many familiar aspects, too. Though Tamriel is broken up into regions rather than joined in one giant environment, most of those regions are as big as the entirety of previous games (if not bigger). You’ll even run into some familiar locations from previous games, giving you the opportunity to see how much some things can change in a millennium…or how little. And this huge world is as ridiculously packed with things to do, as you’d expect from an Elder Scrolls game. The environments are full of fascinating geography and architecture to discover, and populated with interesting, fully voiced characters. The game comes complete with a central quest line, several other major quest lines, and more optional quests than you can shake a horker tusk at. Fans of the faction gameplay will also be happy to learn that the Fighters Guild and Mages Guild offer their own quest lines. And yes, you can become a werewolf or a vampire. Of course, the game also includes plenty of solitary pursuits, including a suite of crafting systems and powerful skills with branching trees. 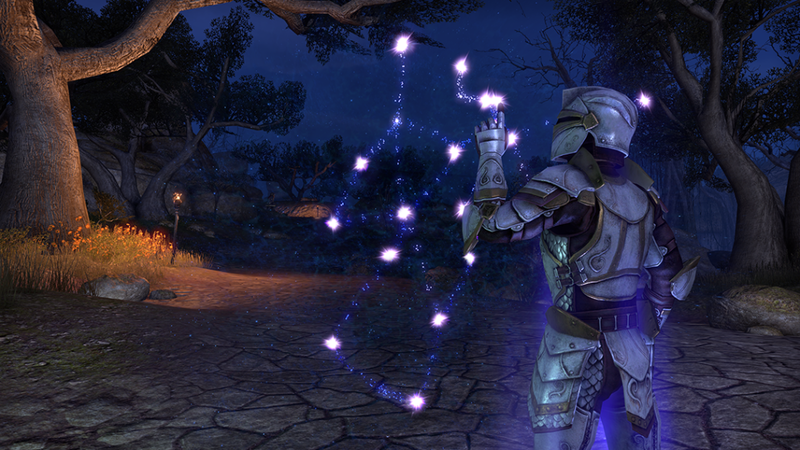 But more importantly, pretty much the whole game can be a solitary pursuit if you so choose: Unlike most other massively multiplayer online games, you can play the vast majority of ESOTU completely solo. In other words, it’s an Elder Scrolls game. 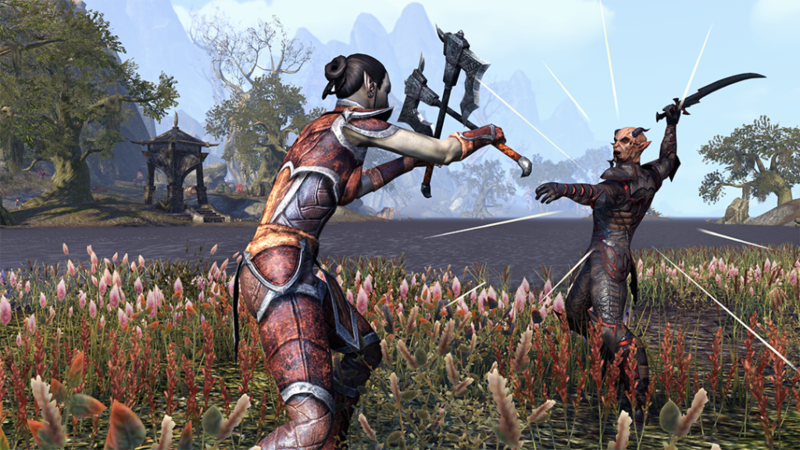 Although the control fundamentals and user interface will be familiar to fans of previous Elder Scrolls games, ESOTU tweaks things a bit to make the always-real-time nature of a multiplayer game more manageable. The biggest control change is the addition of an action bar to activate selected items, spells and abilities immediately; you no longer need to pause the game and make a selection, or scroll through Favorites with the D-pad. Now, you have six spells and/or abilities, plus one consummable item, available for instantaneous use at the touch of a button. Additional items can be accessed by holding Up on the D-pad and selecting from a radial menu, and a similar (and equally customizable) radial menu is available for “emotes” – that is, gestures like waving or pointing, designed for interacting with other players. You’ll notice some differences in skills and leveling, too. For one thing, each of the four classes gets a set of three skill trees all to itself. These skill trees include a mix of active abilities and passive upgrades. Active abilities (which include spells) level up as you use them, eventually growing powerful enough to “morph” into a new, even more useful form. Passive abilities, on the other hand, only become available as the skill itself levels up overall – though they still must be purchased with skill points. This is a good time for a word about skill points: These aren’t handed out only when you level up. You can also earn skill points for completing certain quests. And if you like to explore, you’ll find another great way to earn them: Skyshards. For every three of these shards you find in the world, you earn another skill point to upgrade your character. 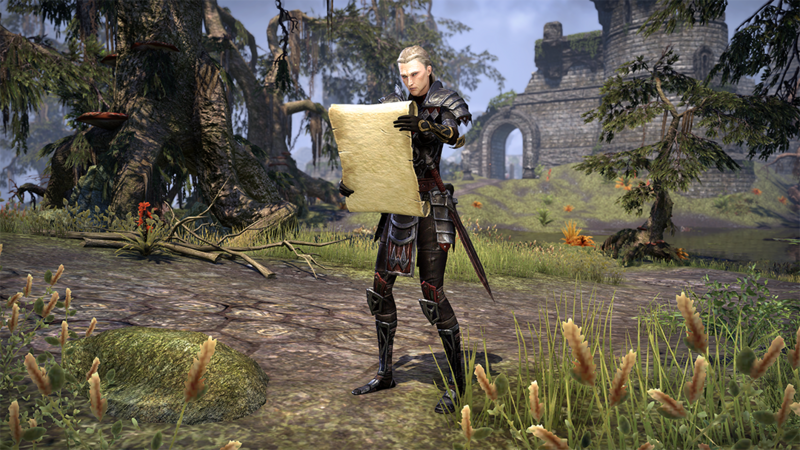 They’re scattered all over Tamriel…but not always on the beaten path. Now, here’s something about leveling that’s unique to multiplayer games: If you plan to group up with other players (and you really should, because it’s a blast), it’s good to have an idea of what kind of role you’d like to take in that group when allocating those skill points. Do you hope to play a healing or support role? Do you want to be the front-line damage-dealer who keeps enemies focused on you? Do you want to hang back and pepper baddies with arrows and/or spells? Any good group needs a mix of these roles, so it’s good to have an idea of where you want to end up in order to determine where you want to invest your skill points. Of course, if you get deep into the game and decide you want to take your character in a different direction, you don’t have to start over. Simply visit a Rededication Shrine, and you’ll be able to re-allocate every single one of your skill points…for a fee. Keep in mind that your experience will change as your character grows. For one thing, you’ll gain even more skill trees as you progress through the game, from faction-based skills to skills based on new experiences. (For example, if you steal from a friendly character, you’ll unlock the Legerdemain skill tree to help support your new life of crime.) New abilities also unlock at certain levels, which will help you further customize your unique character. Level 10 is where one of the biggest changes happens, though. That’s when you get invited to join your alliance in Cyrodiil, to do battle against other players in a zone-spanning war of conquest. This may seem daunting for those of you who have only ever gone up against A.I. opponents in RPGs, but don’t be scared off. For one thing, player-versus-player combat is entirely optional. For another, there’s plenty you can do to help the war effort that doesn’t involve going toe-to-toe with other players. You can pick up quests to secure enemy intel. You can purchase and build siege weapons – catapults, battering rams, boiling oil and the like – to defend your own properties and inflict damage from a safe distance. Or you can find a safe spot to simply heal allies or boost their abilities. That might sound restrictive if it weren’t for two very significant features of the game. First, each alliance’s territory is bigger than the entirety of Skyrim, Oblivion or Morrowind – and there’s three of them. And second, should you wish to explore a different alliance’s territory, you can simply make a new character for that alliance. You don’t even have to start from scratch; you can transfer gold and items between characters easily by visiting a bank in any major city, and specialty items like mounts and pets are available to all your characters instantly. Of course, the biggest way in which ESOTU differs from its predecessors is that you’re adventuring alongside literally thousands of other players. Even if you choose to go it alone, you’ll find yourself immersed in the bustle of other players on similar journeys. There’s no denying that this could be jarring if you’re used to the measured solitude of previous Elder Scrolls games. But understand that your adventure is yours. 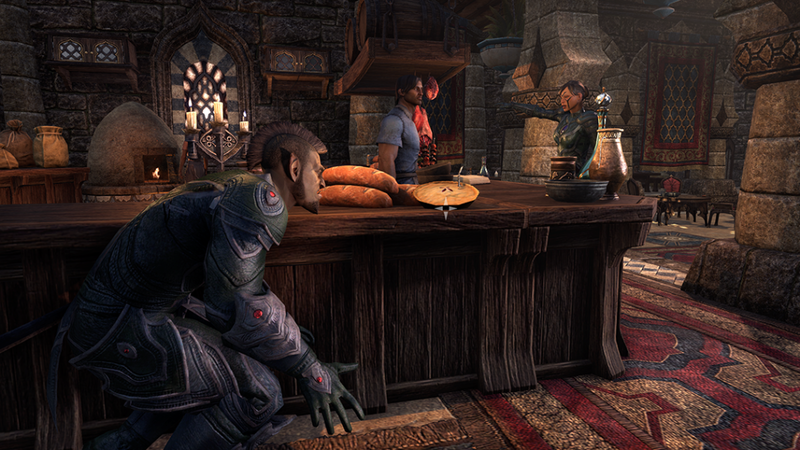 The quest givers won’t run out of rewards, and other players won’t deplete merchant stocks. In fact, it’s quite the opposite. If you choose to join up with other players through the simple grouping system, you’ll find the going can get a lot easier. There will be times when a group can breeze through a challenge that a solo player might struggle with. Groups can take on special dungeons and challenges designed specifically for multiple players working together. You can formalize your relationships by joining a guild, or temporarily join a party using the group-request system. Either way, you’ll find that Tamriel becomes an even more interesting place when you’re exploring with others. You might even make some lifelong friends.